Naomi Grossman (born February 6, 1975) is an American actress, writer, and producer best known for her role as Pepper in the second and fourth seasons and also as Satanist Cardinal Samantha Crowe in the eighth season of the FX horror television series American Horror Story. Grossman was born in Denver, Colorado. In her early life, she performed in community theatre shows. After attending high school in Argentina, she attended and graduated from Northwestern University with a theatre major, as the only university she applied to. She was a member of improvisational and sketch comedy troupe The Groundlings in Los Angeles, California, and wanted to ultimately perform on Saturday Night Live. When the group cut ties with her, she began teaching the Spanish language and separating herself from her acting career. Grossman also writes and produces and has cited Lily Tomlin, Tracy Ullman, Gilda Radner and Carol Burnett as inspirations. Grossman began her career in 1990 with minor television roles, along with commercial and theatre appearances. Not knowing what role she was auditioning for, Grossman sent in an audition for American Horror Story: Asylum in mid-2012 and was cast in soon after as Pepper, a microcephalic; the season premiered later that year on October 17. In preparation for the role, she shaved her head bald. 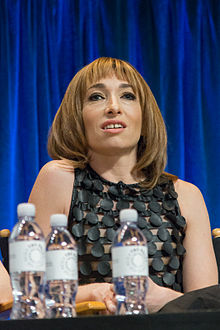 In 2014, it was revealed that Grossman would return to the series in its fourth season, American Horror Story: Freak Show, reprising her role as Pepper from the second season, making her the first to play the same role in two different seasons of the show. She spoke of her casting in the fourth season saying that reprising her role was "the last thing from [her] mind" since it had never been done before. 1990 Father Dowling Mysteries Confirmation Kid Episode: "The Passionate Painter Mystery"
1998 Sabrina, the Teenage Witch Cheerleader Episode: "The Pom Pom Incident"
2012 FammGlamm Gazelda Episode: "Quality Control"
2017 Hell's Kitchen Herself Episode: "Leaving It on the Line"
^ a b c Williams, Tenere. "Naomi Grossman: Actress - "I Could Be On A Desert Island with a Pen, Paper, a Camera, and YouTube and Be Happy"". Retrieved January 6, 2015. ^ Renken, Charlotte (November 2, 2014). "Santa Fe Comic Con: Naomi Grossman "Play With Me! Inside American Horror Story"". Hush Comics. Retrieved January 6, 2015. ^ a b Hayne, Michael (October 24, 2014). "Naomi Grossman of "American Horror Story": "I've never been told I was so pretty until played the ugliest person on TV"". Salon. Retrieved January 6, 2015. ^ "American Horror Story : Season 2". Metacritic. Retrieved January 6, 2015. ^ Branch, Chris (December 12, 2014). "'American Horror Story' Star Naomi Grossman: Pepper Made Ryan Murphy Break His Own Rule". The Huffington Post. Retrieved January 6, 2015. This page was last edited on 24 January 2019, at 11:36 (UTC).